After the alleged suicide of his younger brother in the Army and death of his mother, Capt. Miguel Cortez is court- martialed and dishonorably discharged from the Army. Cortez is spurred on to transcend revenge, uncover the truth and bring justice to his brother's death. 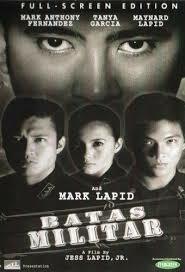 Batas Militar is a 2006 Philippine action film directed by Jess Lapid, Jr. about martial law in the Philippines.